It’s that time again. Time to pack up and trek across the city with your worldly possessions rammed into the back of the car. 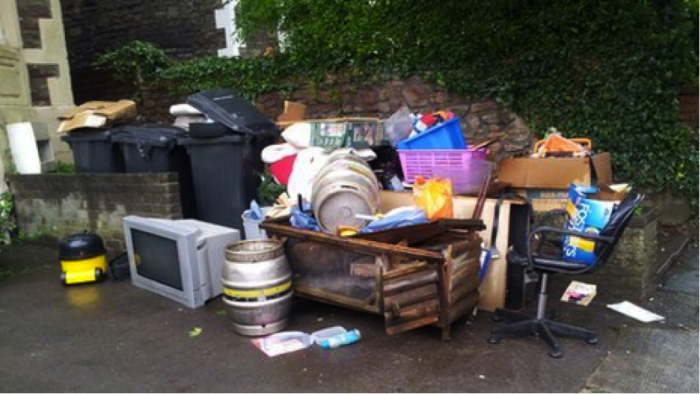 Student front gardens up and down the country are piled high with black bin bags and old furniture. It’s also the time of year that certain students, the clingers on, the last ones standing, end up cleaning out not just their own rooms, but the rest of the house and anything that has been left by the other tenants. Students like me! I don’t know why but I thought that cleaning communal areas might be a shared chore between the 6 of us. Now, 4 days before moving day, me and another housemate are left with the majority of quite a large house to clean. With hindsight I can see I was a little naïve to assume that this would be the case… those housemates have barely cleaned anything all year so assuming they might clean a room before they left, or at least take all their stuff with them was, unfortunately, unlikely! up that was 6 months out of date in the fridge, and various containers full of a substance that may have once been food. We were also left with her cafetiere (why it was there in the first place is a mystery to me! ), a broken flask and a smelly old sleeping bag. Oh and a really REALLY full bin a week and a half before collection day. Thus I loaded her rubbish into my car, journeyed round the city to find bins in supermarkets that would take them, and ended bringing them back home again. Needless to say this housemate will not be receiving a ‘how are things going?’ message anytime in the near future, or the distant future or anytime at all in fact. The second to leave almost cleaned one of the bathrooms and was fairly inoffensive all round at least no miscellaneous items were left. This housemate may receive a message. This leaves four of us. One of these housemates hasn’t been spotted for well over a month and is not currently living in the house but his room is still locked so we assume he still has stuff to move out. We just hope that he knows when moving day is so that he has moved his stuff and will not turn up when the next set of students move in and get a nasty surprise. It seems unlikely now that he will come back and clean anything so we may as well do it ourselves. Another one has been living at her boyfriend’s all year and so we rarely see her. Although this week she moved all her stuff downstairs into an empty room ready for her next move. Consequently I am currently stepping over a Harry Potter style trunk to get in and out of my living room. It was also this housemate’s stuff that was scattered all over the house for me to move – despite the fact she rarely lived here. Just like housemate 1 she has also filled the communal bin with rubbish so it looks like the rest of us are taking our rubbish home or driving around looking for a recycling centre. She will be gone a few days before moving day but will not be cleaning anything or paying off remaining bills because she ‘hasn’t been living here’. So that leaves me and another housemate with a few days to clean a house that has not been cleaned properly for the two years we have been living there and possibly longer (when we pulled the sofa out last week there was a receipt under there from 2007, a very telling sign that our landlord is not a very thorough cleaner). The excitement of shared student housing! I will not be taking a masters or extending my time at uni but here’s a message for those of you who are off to uni soon or who still have another year or two left. Have sympathy for the hangers on that can’t leave the house asap – they’re not your mothers and shouldn’t have to deal with the mess you leave behind!